Fort Lowell was a supply base for the United States Army “Apache Campaigns” between 1873 and 1891. Following abandonment of the fort in 1891, settlers moved in and used some fort buildings as residences, or stripped the buildings of useful materials. By the 1930s, much of the fort had fallen into disrepair or had been sold off. Following its abandonement, a Mexican community established itself in and around the former post. A mission of Holy Family Church, the Chapel of the Guardian Angels, was built in 1915. Ten parishioners lived in "La Barriada de Rillito" adjacent to the ruins of Fort Lowell. The original chapel was destroyed by a tornado in 1929 and rebuilt in 1932. It continued to serve the Mexican community until 1948. It was during this time that the area became known as “El Fuerte”, and descendents of these Mexican settlers still reside in the adobe homes of their ancestors. Eventually, the City of Tucson acquired a large portion of the old fort which became what is today’s “Fort Lowell Park.” A 5.2 acre (“Adkins”) parcel of the former fort containing several original adobe buildings was still in private ownership, and the 2004 County bond election passed a proposal to acquire the land and preserve the historic resources. The City of Tucson acquired the property in cooperation with Pima County through an Intergovernmental Agreement, which provides the means by which the County Bond funding can be used to implement a preservation project. 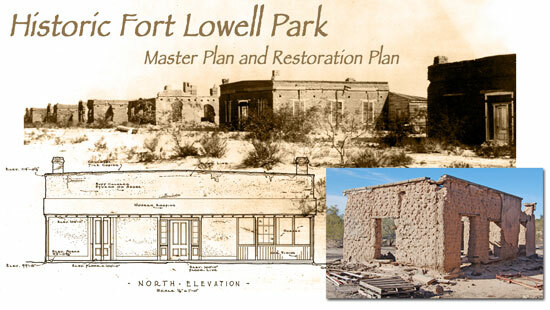 Following this work, the property will be incorporated into the Fort Lowell Historic Park, owned and operated by the City of Tucson. Pima County will continue to be involved through its Conservation Easement to ensure the appropriate management and interpretation of the Adkins Parcel as part of the park in perpetuity. Between 2006 and 2008, site clean-up, inventory and mapping work, and emergency stabilization took place. The master planning process included opportunities for public participation, and culminated in a plan that allows for the interpretation of the existing cultural resources and continued recreational opportunities in the park. Bond Ordinance No. 2004 – 18 / 4.4 (Fort Lowell Acquisition and San Pedro Chapel) allows $3,000,000 to be used for land acquisition, planning, design and construction. The Historic Fort Lowell Park Master Plan is divided into three stages, the first of which is currently underway. Stage 1 is a joint program of the City of Tucson and Pima County and is funded by the City of Tucson and the 2004 Pima County Bond (CR4.04 Fort Lowell Acquisition & San Pedro Chapel). This Phase 1 Selective Demolition Project occurred in 2007 and 2010 and was funded using Pima County Bonds. Phase 1 consisted of the demolition and removal of 10 non-contributing, non-historic, unsafe structures from the site – including six concrete slabs, the Magor House, the Windmill Base, a concrete tank, and a wood shed foundation. Phase 2 occurred between 2007 and 2013 and was funded by the City of Tucson, with a grant from the U.S. Environmental Protection Agency (EPA). Phase 2 involved the analysis and subsequent removal of identified contaminated soils from the Adkins parcel. Phase 3 Preservation Plan design began in 2011, with construction having begun in 2013, and will be completed in 2014. Phase 3 is being funded by the 2004 Pima County Bond (CR4.04 Fort Lowell Acquisition & San Pedro Chapel). Phase 3 consists of rehabilitating Officer's Quarters No. 3, preservation of Officer's Quarters No. 1 and No. 2, infrastructure design, coordination planning with Stages 2 and 3 of Master Plan, and design of landscaping, pathways, fencing, walls, etc. per the Master Plan.